We have previously reported on Red, arguably the premier manufacturer of digital cameras, used to shoot major motion pictures, TV, and incredibly high quality still photography. Red makes digital cameras and associated products that attaches to digital cameras or help digital workflow. The base price for such equipment runs between $15,000 and $50,000, and upwards of $75,000 for a well-accessorized system, and such devices can be used to shoot in almost any resolution including 8K. 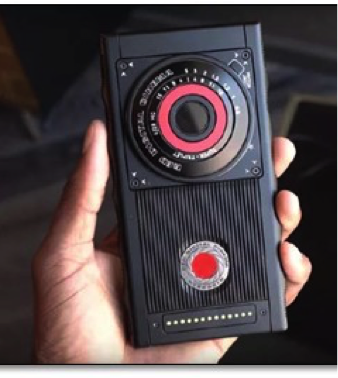 But Red wants more, and the company and its founder have been working on a smartphone, the Hydrogen One, but not just any smartphone, and not just one with a good camera but one with a “4-view display” that seamlessly switches between 2D, 3D, and a holographic mode that allows the user to see behind objects. Of course it is hard to tell exactly what a holographic 4 view display actually is, although the company states that we will be amazed when we look at the display, although the actual release of the phone, has been delayed from some time in 1Q to August, and the company admits that even when it is released, it will probably not be complete. While this is a lot for the typical smartphone user to accept (although the original price of ~$1200 seems to have been lowered through better supply chain relationships to $800 to $900), we doubt the Red smartphone customer will be anything close to typical as the necessity for the ability to shoot 2D, 3D and 4D(?) on your smartphone would be lost for the selfie and “look what I am having for dinner” crowd. Some of the delay comes from the decision to have dual cameras on both the front and back, certification by carriers, and some hardware improvements that allow users to shoot 3D and convert it to 4D directly on the phone, rather than having to upload files to the cloud for processing, but we imagine that regular improvements will keep this idea evolving regardless of any timelines.